Gyeongju, South Korea -- A visit to Korea would simply not be complete without a visit to Gyeongju, the capital of the Silla Kingdom (57 B.C.-A.D. 935) for over 900 years and one of the world’s 10 most historic sites. 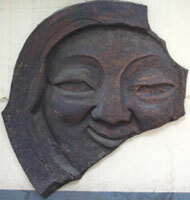 << Smiling face roof-end tile, symbol of the Silla Kingdom and Gyeongju. This magnificent area has earned its reputation as a “museum without walls” due to the high concentration and diversity of historic buildings and objects including 52 properties designated by UNESCO as World Cultural Heritages. The Silla Dynasty created a rich culture in which science, art and craftsmanship flourished. This is evidenced in the many skillfully crafted and artistic stone monuments as well as iron, bronze and gold artifacts that visitors can view at Gyeongju’s numerous attractions. Until it was renamed in 935, Gyeongju was called “Seorabol,” meaning “holy land where the sun shines first” and is also referred to as “the Buddhists’ pure land.” Buddhist culture flowered at the time, a reflection of the sophistication, splendor and prosperity of the Silla Dynasty. From ancient tombs that are scattered almost everywhere to myriad Buddhist and palace relics, visitors’ greatest challenge is finding time to see everything that Gyeongju offers.